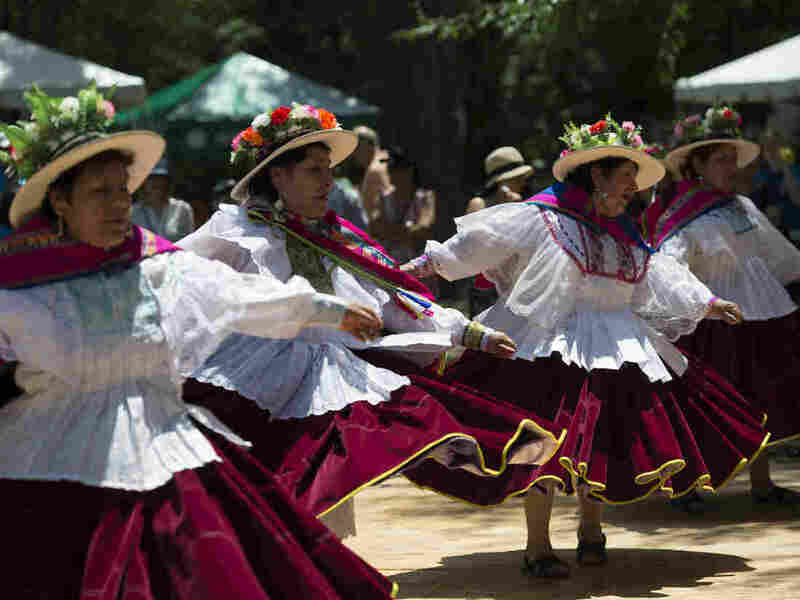 Partial Government Shutdown Bears Some Blame For Shortened Folklife Festival The celebration will take place on June 29 and 30, while the original 10 days of events will be postponed to next year, in part as a result of the partial government shutdown. Peruvian dancers perform at the Smithsonian Folklife Festival in Washington, D.C., in 2015. This year's festival will shrink from 10 days to just two, in part as a result of the partial government shutdown. If you're thinking of attending the Smithsonian Institution's Folklife Festival in Washington, D.C., this year, plan for June 29 and 30. Those are the new dates for the Smithsonian's annual celebration, which will shrink from 10 days to just two this summer, in part because of the partial government shutdown, according to the festival's director. "Unfortunately, the timing of the shutdown sort of played mischief with our production schedule," Sabrina Motley tells NPR. "We thought it was in the best interest of our festival to make this shift." The shortened festival on the National Mall will still focus on the social power of music, this year's Smithsonian-wide theme. But the extended programming that would have celebrated the cultures of Benin, Brazil and other countries has been postponed to 2020, Motley says. "We want to make sure we do everything we can to honor the participants we bring in from all over the world, as well as the visitors from all over the world, and not the least of all our staff," Motley says. "We want to do a good program, and we think with more time we can do that." The festival received its programming funds later than usual this year, according to Motley, which caused a delay that was compounded by the partial government shutdown. The Smithsonian remained open after the shutdown began in late December last year but had to close all of its doors on Jan. 2 and keep them shuttered for most of January. After Smithsonian employees came back to work, Motley says the festival's organizers realized they would need more time to put on the intended production and decided to slim plans for the event. "By the time everything was in place [with funding], then we had the shutdown," she says. "We got hit by the timing." The festival was originally scheduled for June 26-30 and July 3-7. The new festivities planned will include a family concert honoring the life of American folk singer and social activist Pete Seeger, according to Motley, with performers such as Dan Zanes, Elizabeth Mitchell and Sonia De Los Santos. Motley stresses that while people may be familiar with the 10-day celebration, the Folklife Festival has never been a static event. Over the years it has seen different venues and taken place in different months. In 1979, the celebration lasted only five days, while just a few years prior it had gone on for three months. "The festival has changed, and that's probably why its lasted so long," she says. "It has really been viable in all sorts of cultural conditions. This is just another one, and we will definitely be back next year."